An inquiry into the much-discussed stand-off between Kentucky high school students and Native American activists at the Lincoln Memorial last month found “no evidence” that the students made “offensive or racist statements,” either to the Native Americans or the Black Hebrew Israelites. The report was prepared by a third party, Greater Cincinnati Investigations, after a video went viral in January depicting an encounter between Omaha Nation elder Nathan Phillips and the students, the majority of whom were clad in MAGA hats. Aside from what was apparent in the video—a group of privileged, sheltered teenage boys whipped into a self-righteous frenzy—the report did not find any evidence that they used slurs. It did note that “some students performed a tomahawk chop to the beat of Mr. Phillips’ drumming,” but made no further comment on the ways in which that might be offensive. According to Greater Cincinnati Investigations, the report was the product of roughly 240 hours of interviews by four licensed investigators, in addition to 50 hours spent reviewing posts on YouTube, Facebook and Twitter and video from major networks. 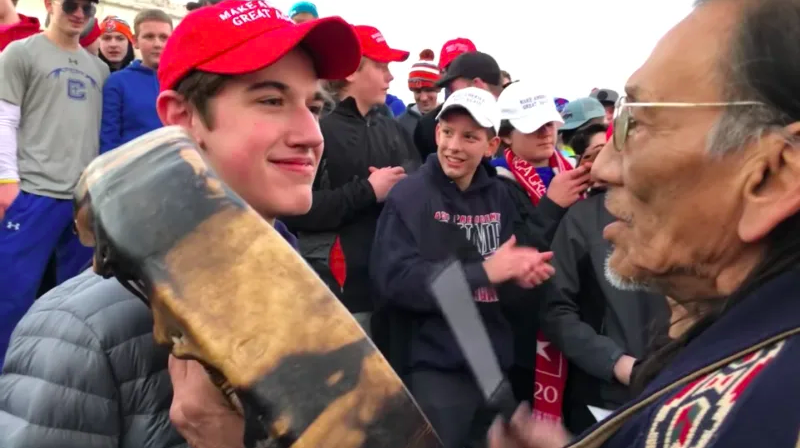 Neither Phillips nor Nick Sandmann, the teen seen prominently smirking while Phillips drummed, were among those interviewed. Dina Gilio-Whitaker, a member of Colville Confederated Tribes in California and professor of American Indian studies at California State University at San Marcos, told the Washington Post she found the reports’ findings disgusting. “Maybe they didn’t say overtly racist things, but the context of the incident needs to be analyzed,” she said.